Covey was the Milwaukee Brewer's first round pick in 2010, one pick after the White Sox selected Chris Sale. Initially offered a $2 million signing bonus from Milwaukee, Covey was diagnosed with Type I Diabetes during the post-draft physical and was offered a lower $1.6 million as Covey would need time to adjust to having the condition, so he elected to go to school instead. After attending the University of San Diego, Covey was selected by Oakland in the fourth round of the 2013 MLB Draft. 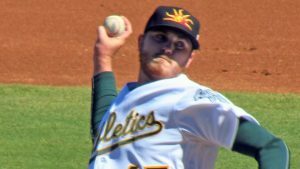 His 2013 and 2014 seasons produced inconsistent results in both levels of A-ball, but he seemed to dial it in during the 2015 campaign (3.59 ERA in 26 starts in the hitter-friendly CAL league). Covey had uncharacteristic issues with control in 2016 in AA, walking 5.2 batters per nine innings. However, these numbers should be taken with a grain of salt as Covey only pitched 29 innings due to an oblique strain in May that prematurely ended his season. This past December, he was taken by the White Sox with the 9th pick in the Rule 5 Draft. Covey has been out since April of this year on the disabled list, and does not yet have a timetable for return. According to MLB Pipeline, Covey throws a 50 grade (20-80 scale) fastball that sits in the low 90s with heavy sink, though it can top out at 95 mph. Also in his arsenal are grade 50 sliders and curveballs and finally a grade 55 changeup. The White Sox will have to keep Covey on the roster for the entirety of the 2017 season or else they'll have to offer the latest Don Cooper project back to Oakland for $50,000 (the Sox paid $100,000 for him). ETA: Start of 2017 season.